Latest plans for Limmattalbahn have this line opening in 2020. Zürich's route 2 will be extended to Schlieren on Limmatalbahn tracks. 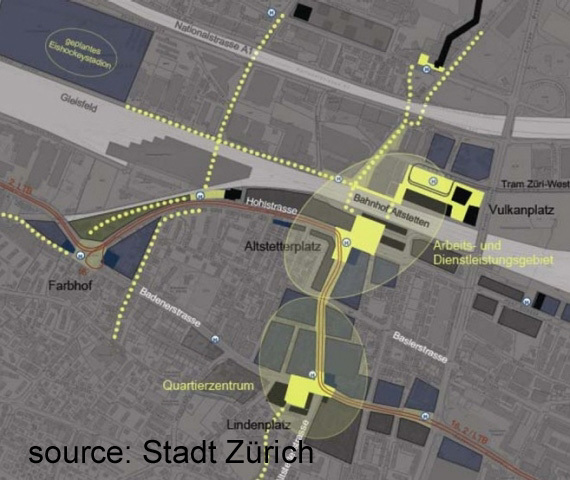 The current Badenerstrasse alignment between Lindenplatz and Farbhof will be discontinued, with trams being routed along a new line shared with Limmatalbahn and serving Bahnhof Altstetten. The dotted lines on the above map are pedestrian routes and the yellow blocks are planned pedestrianised areas. The future alignment of tram route 2 is in red. Presently it terminates at Farbhof and follows Badenerstrasse to Lindenplatz before continuing on the shown alignment to the right. The terminus of Tram Zürich West can be seen on the other side of the railway tracks at Bahnhof Altsetten (Vulkanplatz).